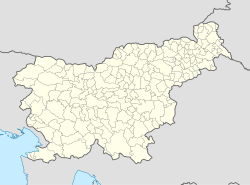 Besnica (pronounced [ˈbeːsnitsa]; German: Weßnitz) is a settlement in the hills east of Ljubljana in central Slovenia. It belongs to the City Municipality of Ljubljana. It was part of the traditional region of Lower Carniola and is now included with the rest of the municipality in the Central Slovenia Statistical Region. The stream that runs through the settlement is also called the Besnica. It is a tributary of the Ljubljanica, which it joins at Podgrad. Besnica includes the hamlets of Derčar, Jančar, Pečar, Prek, Špan, and Tomaž. The name Besnica is originally a hydronym that was later applied to the settlement along Besnica Creek. The name is derived from the Slavic adjective *běsьnъ 'rushing, swift', referring the character of the stream. Schooling was started in Besnica in 1939 in a private farmhouse; a school building was not built until 1954. Besnica is where the first German soldier fell in Slovenia during the Second World War on July 16, 1941. The spot is marked by a memorial. There is also a memorial plaque at house no. 23 in the village, where a Partisan soldier was killed on May 21, 1942. A small chapel in the settlement dates to the early 20th century. ^ Leksikon občin kraljestev in dežel zastopanih v državnem zboru, vol. 6: Kranjsko. 1906. Vienna: C. Kr. Dvorna in Državna Tiskarna, pp. 97, 106. ^ Snoj, Marko. 2009. Etimološki slovar slovenskih zemljepisnih imen. Ljubljana: Modrijan and Založba ZRC, p. 58. ^ Savnik, Roman, ed. 1971. Krajevni leksikon Slovenije, vol. 2. Ljubljana: Državna založba Slovenije, p. 359. This article about the Municipality of Ljubljana in Slovenia is a stub. You can help Wikipedia by expanding it. This page was last edited on 13 March 2017, at 09:11 (UTC).